Hey Everyone! Hope you are all okay! So today I thought I'd talk to you about my favorite product to use in the shower at the moment and that is the Cafe De Bain shower cremes. A girl I know from my training with Thomas Cook last year actually messaged me to let me know about this purely because she thought it would be something I would like and something I could blog about and as you can see she wasn't wrong. I absolutely love them! Keep reading to find out more about why I like them. First things first, just look at the packaging?! Isn't it so pretty? Now these shower cremes comes at a ridiculously cheap price of £2.99, but you would never think that by just looking at them! The gorgeous gold lids and old style logos on the top make them look super high end. I also love the fact they come in really pretty pastel colors too which makes it really easy to spot in the shops and easily distinguishes them from other shower gels and cremes in the shops. They also look extremely pretty and luxurious on my shower rack in my bathroom. I also love the fact they are 250ML as well! That is a lot of shower creme! It should last you ages! 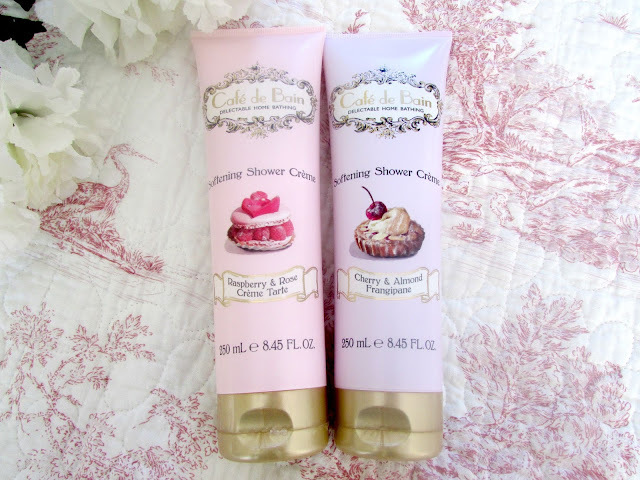 When it comes to shower gels and cremes I always opt for those which have a sweet scent. Mainly because I think they last longer and smell nicer and it's just a personal preference. I basically like to smell like freshly baked deserts apparently. These definitely don't disappoint. They smell absolutely incredible but they are not too overpowering either which is extremely important when it comes to sweeter scents I reckon as too sweet can be very off putting. The Raspberry and Rose shower creme smells very much like when you walk into a cake shop and are hit by all the gorgeous baked treats scent. It's just delicious! 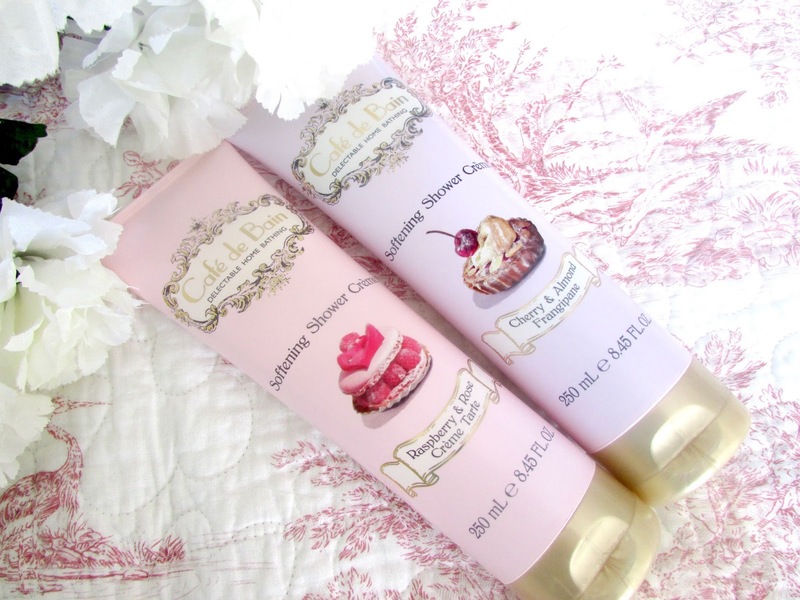 The Cherry and Almond shower creme smells a bit like marzipan is just amazing. Definitely a lovely fresh and sweet scent. In terms of the formulation, I find these to be extremely thick and creamy (well obviously, they are cremes). I find that these definitely leave my skin feeling extremely soft and smooth as well. I find that these definitely leave your skin feeling extremely moisturized as well. When it comes to lathering up in the shower I do find that this works best with a loofer or shower puff or whatever it is you would like to call it. I am a bit of a bubble freak so I like my shower cremes and gels to have as much lather as possible as I like the way it makes my skin feel. I'm not weird at all I promise you! Overall I absolutely love these shower cremes and will highly recommend them. There are four in the range all together and the other two scents in the range are Sweet Vanilla and Coconut Macaroon both of which I've already had a sniff of and they definitely smell incredible. I mean for only £2.99 you just can't go wrong with these. What are your favorite shower cremes/gels? Do you prefer sweet or fresher scents?